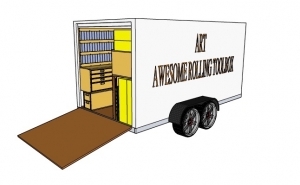 The ART (Awesome Rolling Toolbox) Plans are designed to help you build and impressive and organized workspace. The 21 detail rich pages will help you build your own tool storage system and keep you organized and efficient. These plans are drawn for a 7x14 trailer, but can be modified to fit any size trailer, to fit in your garage or the shed out back. This organized working setup has been featured in many online and print articles. All plans are delivered via downloadable PDF and contain BOTH Metric and Imperial Measurements. When your purchase is complete, scroll down to the bottom of your receipt for the link to download your plans!